Recent news of the oil sands generally focuses on current per barrel prices or whether or not the U.S will buy into Canada's vast oil wealth. Unfortunately the oil sands rich and varied past is often neglected. The history of the sands is a surprisingly thrilling read that one woman has spent over 20 years researching and chronicling. Joyce Hunt a Canadian historian is on a mission to tell the tales of the many people drawn to the oil in northern Alberta between 1905 and 1930. A major oil sands player, Imperial Oil, is looking to invest in a C$8 billion Kearl oil sands venture in northern Alberta. With a long term view the company hopes to profit from the tightening credit conditions and take advantage of freed labour and resources. Just goes to show that the long term view is the way to think when investing in the area. Especially when it comes to real estate. Of course there will be ebbs and flows in the market but over all waiting them out, buying cash flowing properties strategically are all ways to keep your investment solid. "Canada's oil sands are the largest crude deposits outside the Middle East, but production is far more complex and expensive. With oil prices around $40 a barrel, down from a July peak above $147, at least C$90 billion of oil sands developments have been put on hold. How is the recession affecting you? Do you even notice that there is a recession or has your business been flummoxed? Do you find this is the time to tighten your belt or have you been expanding due to lowering prices and cheaper labour? 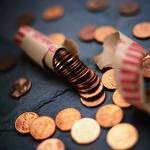 Are you practicing frugality- if so how anything this extreme? Any tips real estate related or in general to cut costs? I'd like to see how everyone is doing. Please take my mini poll in the upper left corner. Although the rest of Canada's real estate markets may still be seeing a slowdown this year. Edmonton is starting to pick up. Specific property types will see a jump in sales this year as new buyers enter the market. Edmonton still is number 1 -"The results are in and Edmonton was named the number one city to invest in, according to the Real Estate Investment Network (REIN). Backed by a healthy economy, infrastructure development, a growing job market and increasing population, the ‘City of Champions’ may be a sure bet. Gone are the days of double-digit price increases and condos that are snapped up as soon as they’re listed. Now, Edmonton’s market reaches a more historic norm as it stabilizes. This is expected to alleviate pressure for buyers since they can negotiate their terms. Condos are favoured among Edmonton’s growing Baby Boomer population, which grew 43% between 2001 and 2006, according to Statistics Canada. This aging demographic enjoys the low-maintenance lifestyle that these units present. Also, first-time home buyers choose condos due to affordability. According to RBC’s 2008 affordability index, a buyer would have to earn $86,337 per year to qualify for a mortgage on an average home priced at $354,060. Condos have a more favourable affordability index of 26.2%, meaning the buyer would need an annual income of only $57,417. Investors looking for cash flow can expect one with a condo. These units are expected to see a 12.2% increase in rent in 2008, according to CMHC. The average rent for a two-bedroom apartment was $1,000 in April 2008. “Edmonton is the largest rental apartment universe and people are trying to capitalize on the fact that the economy is still doing well,” says Julie Taylor, analyst at CMHC, Ottawa"
This Video will make you feel like some of your "To Do" list stress is really laughable. It is so inspirational I realized (again, I often forget!) there is a lot to be thankful for in the simplest things. Wherever your real estate investment is located—provided you bought it at the right price and terms—there are many ways to keep your property profitable. If you analyze your real estate, update and improve your investment team, review your long- and short-term investment plans and stay focused on the end result; your real estate portfolio will be a rock solid fortress that can weather any storm. Obama: Invest in Canadian Oilsands or Be Held Hostage - "Russia bullies its European energy customers; Saudi Arabia, Iran and others export terrorism; Nigeria is unstable and Venezuela's Hugo Chavez spews hate. This means there is little choice for the U.S. and the world, but to embrace, and possibly finance, Alberta's gigantic oil sands. True the Canadian oil made from these sands is dirtier than Saudi crude, but the choice is dirty oil from a clean regime (Canada) or cleaner oil from dirty regimes. Besides, the oil sands production process can be cleaned up with investments in carbon recapture and research into more efficient refinery methods that use less natural gas and water." Renewables could power Alberta, says think-tank Pembina Institute says switch feasible - "Alberta can switch its electricity source from coal to clean renewable energy sources in 20 years, creating jobs, reducing greenhouse gas emissions and creating a more stable price for energy, says a report released this week. There are no technological barriers standing in the way of this vision, but it will take political leadership and consumer demands to make it happen, says one of the authors of the report from the Pembina Institute environmental think-tank." Edmonton's jobless rate among lowest in Canada - "Alberta’s unemployment edged up in December as 15,800 jobs vanished, but the province continued to lead the country with the lowest jobless rate by a wide margin, Statistics Canada said Friday. And Edmonton’s 3.6 per cent unemployment rate — up just 0.1 per cent from November — was the lowest among major cities in Canada, tied with Regina and Victoria. Calgary’s rate is at 3.9 per cent." This video leaves me saying "and so what??" Seems fairly inconclusive and not very informative to say the least. Of course there is a lot of speculation in the market (can be seen in any market). I think it's naive to think that oil trading at $40/barrel is the true market value. Basically the pendulum swings up and down in any speculative market. If you take a step back from today and look 5, 10 or 50 years from now there is still is going to be a huge demand for oil. Yeah, it will fluctuate up and down in those years. If you are someone who thinks the Chevy Volt battery powered cars, solar and wind energy will replace oil in the next few years- what fuel will be used to replace oil in the manufacturing of these new technologies? Robert Kiyosaki sometimes writes for Yahoo! Finance. His articles are insightful and this week's couldn't have been more bang on. Taking advice in this economy that equates to doing the same thing you have always done will get you worse than the same results. It could lead to a very uncomfortable financial future. Who can say what will happen with the stock markets and economies around the world. Don't bet your future on a salesman's spiel. "So what is wrong with those giving the advice and those following it? Now that the markets have crashed and trillions have been lost, these so-called experts continue on like mindless parrots, saying over and over again, "Polly wants you to invest in a well-diversified portfolio of mutual funds." For me I want tangible assets that produce cash flow. It's common sense when everything else goes haywire I will have passive income coming in from well chosen properties. Why gamble your life savings?? The whole world is feeling the effects of the credit crunch and "frugality is the new black". Everyday when I check www.msn.com there are new ways to cut costs, implying that everyone wants to reduce their expenses and increase bank account balances. Today it was "how to fix up your kitchen for less"
Here is to cutting coupons! Jumping into '09 columnists continue focusing on the negative. Sure, things will get worse (especially in the U.S.) before they'll get better - but certainly, they will get better. What doesn't kill banks and businesses will make them stronger. U.S. president-elect Barack Obama plans to travel to Canada for his first international trip after he takes office, to speak with Prime Minister Harper. Fingers crossed that Canada won't fumble the Oil Sands ball moving forward and gets off to a good start with the new President. Its hard to imagine these current economic clouds passing, but when they do we should be left with a stronger and more transparent economy. "I've stopped looking at the monthly statements on my RRSPs and stocks these days. It's too discouraging. At last check I was down 75% of the actual money I'd put into the portfolio. What the hell: it's a paper loss, right? I'm hardly alone. How can you own a safe and secure investment without using your own money? Canadians with good credit and steady jobs are feeling stuck on the sidelines when it comes to investing because they lack the funds. Spending their time working, saving for a home or putting money into their RRSP leaves little leftover cash to actively invest. Glenn Simon Inc. offers a unique solution to this common challenge many Canadians face when it comes to investing. Glenn Simon Inc. is an Alberta based wealth building joint venture investment real estate company. The owners, Todd Millar and Danielle Millar, are investment experts who partner clients with equity building Edmonton, Alberta oil sand real estate, strong appreciation and consistently profitable, safe and secure investments. They offer a wide range of services. Using the A.C.R.E (Authentic Canadian Real Estate) system to evaluate property, they also arrange property mortgages, set-up joint venture accounts, offer full service management, maintenance and a hands free investment partnership for their clients. "We kept hearing from frustrated Canadians wondering how to get into investing. It inspired us to research ways to help folks with little capital get started. Being fairly risk adverse I wasn't going to advise clients to borrow or leverage against their assets to invest. I knew that there had to be a way for these would-be-investors to get in the market without going into debt" said Todd Millar, investment director of Glenn Simon Inc. This system allows investors to receive an equity position and cash compensation by holding the mortgage of a revenue property. "The strategy is simple." says Millar. "Basically this program is suited for Canadians who are interested in building an investment portfolio but lack the capital needed to get started. Candidates should have a good credit score, steady job history and not have completed too many prior real estate transactions (specifically mortgages)." A typical structure looks like this, within a private investment program, Glenn Simon Inc. carefully selects a cash-flowing revenue property in an economically strong area of Alberta. They provide all the capital needed to purchase and operate the investment, bringing years of experience and a proven track record to the table. The investor takes the role of qualifying for and providing the mortgage in return receiving an equity position and a cash bonus for each transaction completed. It's important to note, that all mortgages and property purchases strictly adhere to federal and provincial lending laws and are completely transparent. "We are really offering a unique chance for the average Canadian to build a portfolio of real estate without using any of their money. It's a perfect route to get into the market with less exposure all the while learning about investing" says Millar. Husband and wife team Todd and Danielle Millar, own and operate Glenn Simon Inc. The Millars are experts in the Edmonton real estate investment field and help people from all over the world safely and profitably invest in the Alberta region of Canada. Todd Millar – President of Glenn Simon Inc. has highlighted the benefits of investing in Edmonton, Alberta real estate since 2002. Millar has been featured in various articles including NuWire Investor Magazine and Executive Impact - Japan Times. Millar contributes his strategies for building successful joint venture partnerships in REIN materials, authors a bimonthly newsletter, is featured in best selling author Don Campbell’s ‘51 Success Stories from Canadian Real Estate Investors’ book and has many client success stories to his credit. Millar shares his insights speaking at investment seminars and workshops in Canada and Japan, and is available for interview. Probably the safest place in the world to park your investment funds. Edmonton revenue real estate is a tangible asset so it doesn't have scary fluctuations, produces cashflow which means increases in your bank account every month and is a bargain right now. My last post focused on negative media and find what the real story is behind the "negative- speak" headlines. Also make sure the articles are about your region and not a national piece, especially when it comes to real estate. In 2007 Edmonton single detached home prices reached a peak at around $420,000 which was unsustainable and grossly affected affordability. In the second half of 2007 prices started to slump and stayed low for most of 2008. Now Edmonton is starting its recovery from the housing slump earlier than the rest of the country. The city's real estate market is more stable and Edmonton will continue to lead the country in 2009. While the rest of Canada faces further cooling in real estate prices Edmonton will remain solid and even see a price increase by the end of 2009. Economic woes put target on foreign staff - "We don't forecast for temporary foreign workers because it's based on employer need," said Alberta Employment and Immigration spokeswoman Jennifer Raimundo, noting companies have to prove to the federal government they need to go out-of-country to find suitable workers. "Certainly, with the economic changes that are happening, we're monitoring it closely. But we're still in a labour shortage situation. We're not in a situation where we don't need people." * So if there weren't a labour shortage the temporary workers would be the first to be let go? Isn't that common sense? "The picture that is appearing less rosy in Alberta is driving people back home, says Mark Fracchia." 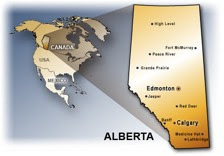 - "The appeal of Alberta and its seemingly endless high-paying jobs is dimming. The Edmonton Sun reported on Dec. 28 that Alberta's oilsands are in trouble, and so is the attraction that comes with them, because of tumbling oil and gas prices. With the economy of the western province tied to the energy sector, Albertans are looking to the new year with worry, said Premier Ed Stelmach, who called the news of the province's economic situation as worsening almost daily. In Alberta, many high-profile oilsands projects have been put on hold. Meanwhile, thousands of jobs and millions of dollars in investment are going to the United States, where refineries are being adapted to process raw Alberta bitumen. Essentially, the resource is still being retrieved from Alberta, but without the capabilities to refine it, the bitumen and a lot of jobs are leaving the province. But in the Sussex area, 2009 is the year a lot of people have been waiting for to get their hands on a job, even a temporary one, at the $1.7-million Picadilly mine development. Since the project was announced a year and a half ago, hundreds of people have been working to prepare the site and the initial construction. But this year marks the real beginning of the ramp-up period. By this summer, about 800 people are expected to be at work on the project." *The $1.7 million mine stands to hire 800 people. We better all (all 800) pack now and leave the billions of dollars of investments to whoever is left. Alberta could earn less under new oil royalty program - "Some high-producing wells will pay more, and the vast majority of lower-producing wells will pay less." The cross-over point at which the new royalty plan will collect more or less cash on conventional oil is about $45 U. S. per barrel, and around $5.50 Cdn. per gigajoule for natural gas, McManus noted. Crude closed Tuesday at $48.58 a barrel and the Alberta spot price for natural gas was $6.27 per gigajoule. "In situations of low productivity and low commodity pricing, there will be a lot our producers in Alberta that will actually see some benefit in the new royalty framework," said Energy Minister Mel Knight. "It won't be negative for everybody." Knight, however, argued Alberta isn't in "any danger"of collecting less royalties under the new system as opposed to the old one." *Alberta could earn less but there is no danger of it happening. Just like I could win the lotto - it's all possible! There is nothing wrong with this article, be prepared for price increases in Edmonton late 2009. Resale real estate sales, prices to decrease slightly in '09: Royal LePage -"Royal LePage said that after moving through a period of correction that started in 2007, well before other regions in the country, both Calgary and Edmonton's housing markets are anticipated to return to a growth state later in 2009, characterized by stable average house prices and increased unit sales. Despite slowdowns and delay with some major energy projects, Alberta's economy remains one of the strongest in Canada, said the survey." We are back at work after a really great holiday. After a great stay in a 300 Year Old Japanese Onsen hotel , enjoying our sons first Christmas we rounded the holiday off by a visit to our friends and master mind group in Saitama. Once again by meeting like minded people who challenge and inspire us we are starting the year focused on giving our partners the best service and helping investors reach their goals.